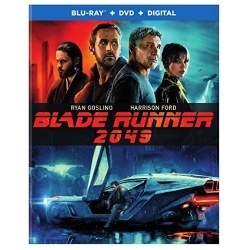 Science fiction fans will love the new Blade Runner 2049 Blu-ray release from Warner Home Video on January 16th, 2018. Hampton Fancher and Michael Green wrote the screenplay for this stylish Sci-Fi thriller. The film is of course a sequel to the 1982 film Blade Runner. The story is set some thirty years later, where ‘Blade Runner’ LAPD Officer K uncovers secrets that threaten the peace between humans and replicants. In the year 2049, bioengineered humans called replicants are servants and slaves in society. Replicant LAPD officer K works as a ‘Blade Runner’, an officer who hunts down rogue replicants that have gone into hiding. At a protein farm, he finds and ‘retires’ rogue replicant Sapper Morton, and discovers mysterious a box buried under a tree. The box contains the remains of a female replicant who died during an emergency C section. Demonstrating that replicants can reproduce sexually, something previously thought impossible, K’s superior Lieutenant Joshi is fearful this knowledge could be dangerous. As such she orders K to find and retire the replicant child to prevent the truth from coming out. Now that the Wallace Corporation headquarters owns what remains of the Tyrell Corporation, K goes there to find out what he can. The deceased female is identified as Rachael, the experimental replicant designed by Dr. Tyrell some 30 years previous. While K begins his search for former Blade Runner Rick Deckard, Wallace CEO Niander Wallace has plans of his own for Rachel’s offspring. Blade Runner 2049 is an excellent sequel to what has become a cult favourite among science fiction fans. I took this opportunity view the original film to refresh my memory, and the way the new film maintains the sense of the universe is impressive. The first thing I noticed though was how huge the audio feels on the new film, adding an immersive quality on top of the visuals. Again the visuals pay homage to the original movie, though we go out into a much wider range of locations. The movie takes place 30 years later, and the world has somewhat gone downhill in that time. Note that we are 30 years in the future of Blade Runner‘s 2019, which is no doubt somewhat different from how 2019 will actually be. Nevertheless it is great to revisit this world with a strong and worthy film that captures the grit and sentiment of the original movie. While Blade Runner fans are likely to be impressed, a more casual audience may find the movie somewhat polarizing, either loving or hating it. For me though this new addition to the Blade Runner universe is a solid addition that I highly recommend. The cast includes Ryan Gosling, Harrison Ford, Ana de Armas, Sylvia Hoeks, Robin Wright, David Dastmalchian, Dave Bautista and Sallie Harmsen. Blade Runner 2049 was directed by Denis Villeneuve, the man behind Incendies, Prisoners, Enemy, Sicario, and Arrival. The critical response to the film was very positive, with a Rotten Tomatoes score of 87%, and an IMDb score of 8.3/10. The movie has received five Academy Awards nominations, including Best Production Design, Best Visual Effects and Best Cinematography. Blade Runner 2049 saw limited success in the USA, taking in $91.8M at the US box office. However the movie was a winner overall, with an international total of almost $260M against a $150M budget. The video on the disc is an AVC 1080p encode at 20.5 Mbps, and is presented in its original aspect ratio of 2.40:1. Visually speaking the new Blade Runner film is a stunning work of art. With distinct similarities to the original, this new movie takes us even deeper into the fictional world. Cinematographer Roger Deakins is a master of his craft, and this Blu-ray presents his work beautifully. That said, if you can I would seriously consider the 4K Ultra HD release for this movie. For full resolution PNG screen captures taken directly from the disc you can check the details page for Blade Runner 2049. The main audio is Dolby Atmos object based audio, and makes extensive use of it throughout. The disc is a dual layer BD50, with 49.2 GB used and is coded for All Regions. As you might expect for a big budget film, the Blu-ray release for Blade Runner 2049 has a nice collection of supplemental features. This extensive supplement delves into the challenges to design the sets and characters for the new Blade Runner movie. Cinematographer Roger Deakins was brought into the project very early in order to ensure that the desired look was achieved. Another key move was to make practical sets for as many scenes as possible, which in turn inspired the actors. The cast and crew weigh in extensively on the nature of the universe and the design of the sets and props. Original Blade Runner artist Syd Mead was also brought in to get the genuine look and feel to conceptual locations like Las Vegas. All in all the film makers have put together a design that creates a movie that is a visual work of art. Here we get a closer look at the casting for the the new Blade Runner movie. Director Denis Villeneuve discusses finding his muse in actor Ryan Gosling. Gosling was a first choice for the writers, producers, and even Harrison Ford. Villeneuve also introduces the strong female characters and the actors that portray them in the movie. Perhaps needless to say, the actors were all very enthusiastic to participate in the movie. Dennis Villeneuve introduces three short stories that fill in some of the events between the two feature movies. The black out which destroys most of the data in the world is presented in this Anime short. With the advent of the Nexus 8 replicants with no expiration date, the humans fight for supremacy. However the replicants are also fighting back. Recluse Niander Wallace makes the case to end the prohibition of replicant technology. Sapper Morton finds himself on the run after protecting his friends. There are also a number of short supplements that delve into the new aspects of Blade Runner 2049 under the Blade Runner 101 category. The cast and crew discuss the new role of the Blade Runner and how it became a job for replicants. The new line of replicants design by Wallace are introduced. How Niander Wallace rose to fame and power by saving the world. Life on earth 30 years after the original Blade Runner film is presented. The digital hologram named Joi is an AI companion that is popular in 2049. Here we are introduced to the flying vehicles and props in the movie. All in all we have a good hour of interesting extras include on this Blu-ray release. Blade Runner 2049 is an excellent follow up to the original Blade Runner that will appeal to fans of the original. The Blu-ray release from Warner Home Video is technically strong with Atmos audio and features a great set of extras as well. Thirty years after the events of the first film, a new blade runner, LAPD Officer K (Ryan Gosling), unearths a long-buried secret that has the potential to plunge whats left of society into chaos. Ks discovery leads him on a quest to find Rick Deckard (Harrison Ford), a former LAPD blade runner who has been missing for 30 years. This entry was posted on Tuesday, January 23rd, 2018 at 10:19 pm	and is filed under Atmos, Blu-ray, Commentary, Drama, Mystery, Sci-Fi, Science Fiction, Thriller, Warner. You can follow any responses to this entry through the RSS 2.0 feed. You can skip to the end and leave a response. Pinging is currently not allowed.